Charity Navigator: Is Your Donation Tax-Deductible? Tax Day, April 15, is just around the corner. That means many of us are about to begin the mad dash of rounding up our forms, statements, and receipts, while we can still make an appointment with an accountant. In the midst of the Tax Day scramble, Charity Navigator is dropping in to talk a bit about the tax-deductibility of charitable giving. Keep reading to learn what qualifies as a tax-deductible donation. An organization’s charitable status is key to determining your donation’s tax-deductibility. For a gift to be fully tax-deductible, a nonprofit organization must be designated as a 501(c)(3) by the IRS. Tip: All of Charity Navigator’s rated organizations have received a 501(c)(3) designation. 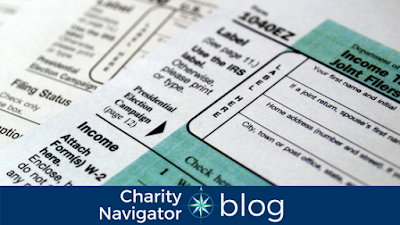 There are 29 possible IRS designations for nonprofit organizations. While donations made to 501(c)(3) organizations are the only gifts that are certainly tax-deductible, portions of gifts made to nonprofit organizations that have received another designation may be deductible. Contact these organizations directly to determine if you can deduct your gifts this tax season. If you made any gifts through crowdfunding platforms, like Kickstarter or GoFundMe, take a look at your receipt. If the gift benefitted a nonprofit organization, you may be able to deduct it (again, this is based on the organization’s IRS designation). However, if the gift benefitted an individual or for-profit venture, it will not qualify to be deducted. Donations: No goods or services exchanged. You may have noticed a short blurb on the bottom of your charitable tax receipts that says something like, “...no goods or services were exchanged…” This means your donation was at your will and you did not receive anything in return. This is the other key to determining your gift’s tax-deductibility. Many nonprofit organizations offer a product or service which they sell, like a for-profit company, to generate revenue. An example of this is a local YMCA selling gym memberships. While the YMCA may have received a 501(c)(3) designation from the IRS, purchasing a gym membership is not tax-deductible because you are receiving a service in return for your payment. However, a free-will donation to the organization would be. Another common example is a fundraising dinner or gala. You often pay per plate to attend the event. The cost of the dinner, as determined by the event venue and organization, is not tax-deductible because you are receiving a meal in exchange for your payment. However, if you were to give a donation above and beyond the cost of the plate that would be tax-deductible. These are the two basic keys to determining a donation’s tax-deductibility, however, it is always best to work with your accountant or financial planner to determine whether or not a donation qualifies. And, remember to keep receipts for all charitable contributions and payments made to nonprofit organizations to ensure you receive the appropriate deduction.